In a recent article in the Boston Globe, the Harvard Joint Center for Housing Studies reported a steady rise in home improvement spending. Bathroom renovations that introduce spa-style amenities (steam showers, heated floors, etc). In many cases homeowners are removing little-used bathtubs in favor of large, elegant walk-in showers. Some homeowners are choosing to enlarge their bathrooms, too – often by co-opting adjacent hallway, closet, or other space. 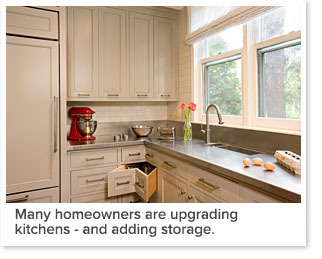 Kitchen renovations that improve functionality, usually by adding storage and meal preparation space. Islands remain popular, but increasingly, offer much more than simple gathering space, with sinks, dishwashers, and cabinetry built in. Also, the popularity of open floor plans, where the kitchen is exposed to living and dining areas, is diminishing a bit. Instead, we’re seeing homeowners widen openings between spaces while maintaining distinction between rooms. Adding storage. We have much more stuff than our ancestors ever imagined! This often requires creative solutions that reconfigure existing square footage. We’ve added storage under stairs, built bump-put closets in underused spaces like foyers and hallways, and even carved out wall space. We’ve also remodeled unused bedrooms to become walk-in closets. Planning for the future. Aging-in-place is a consistent concern for many homeowners who want to make sure that their renovation decisions today will allow them to live safely and comfortably in their homes for many years to come. These fixes include everything from lowering counter and cabinet heights to introducing bath and shower safety features. Looking for a fun holiday event? Gather Here, in Inman Square, is hosting a Handmade Holiday Market on Sunday, Dec. 18, from 11 a.m. to 6 p.m. Support local artists and purchase one-of-a-kind, handmade items for your loved ones. At 1343 Cambridge Street, Cambridge. We announced our support of the Cambridge Historical Society’s 2016 History Fellows program, in which four Cambridge residents were selected to research topics related to the theme “Are We Home?” Our $1500 grant supports research by History Fellow Donna Karl, who is exploring the background of her 1903 simple Queen Anne house and its North Cambridge neighborhood. Charlie met with Donna to share his period home expertise last month, and in August, the Cambridge Chronicle wrote about this and other CHS initiatives. View article here. Kitchen & Bath Business profiled our work on a Cambridge home where we remodeled three bathrooms. In each case, the bathtub was removed in favor of a spacious walk-in shower.View article here. Boston Globe reporter Jaci Conry spoke with CAR Project Development Manager Mark Philben about a just-completed project that involved remodeling several rooms in a recently-built home. In the article, Mark detailed some of the most interesting elements of the family room, including a mantel and coffee table built from a 100-year-old Boston Harbor ladder. View article here.